The Owl and the Bear is a cautionary tale about the perils of vanity in which Muhu the Owl’s need for admiration leads to her good looks being crushed during a big bear hug. 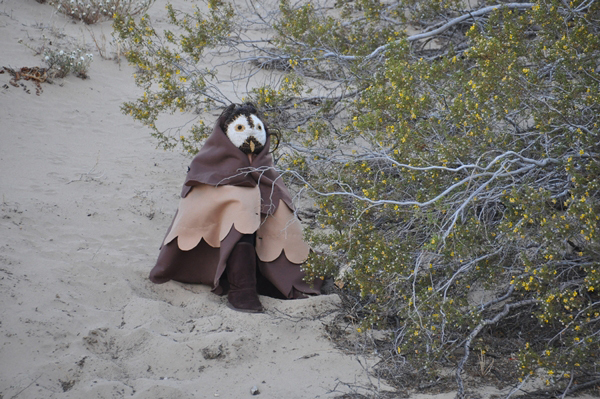 Savannah Murga will play the part of Muhu the Owl, and Princess Mayfield will play Xus the Bear. Austin Szintai will play Coyote, and Shannon Batu will play Slo the Eagle. Sienna Batu will play Deer, and Blake Bonafede and Orayah Stevenson will play Rabbits. Advance tickets are on sale at the Antelope Valley Indian Museum gift shop Saturday and Sunday from 11 a.m. to 4 p.m. Remaining tickets will be available for purchase at the door on a first come, first served basis on May 4. Food will be available for purchase from 6 to 9 p.m., so you can enjoy dinner either before or after the play. The play will start at 7 p.m. and last until 7:30 p.m. After the performance, the museum will reopen until 9 p.m. The history of theater at the museum dates back to 1932 when museum founder Howard A. Edwards wrote an Indian pageant. It was performed outdoors, near the museum, annually from 1932 to 1935. Edwards’ drama students from Lincoln High School played the main roles, and local friends and neighbors played the secondary roles. Edwards named his outdoor stage Theatre of the Standing Rocks. Directions: From the 14 Freeway in Lancaster, go east on Avenue K to 150th Street East. Turn right and go south for two miles to Avenue M. Turn left and go east on Avenue M for 1 mile to the museum. The event is a fundraiser for the Friends of the Antelope Valley Indian Museum. Pets are not allowed. For more information, phone the museum at (661) 946-3055 (711 TTY relay service), or visit our website at www.avim.parks.ca.gov. Join us on Facebook at www.facebook.com/AVIndianMuseum. The museum hosts an American Indian Celebration annually on the third weekend of October. The celebration includes Native dancers, traditional Chumash stories, and Native artists and food. For more information, phone the museum at (661) 946-3055, 711, TTY relay service.